So the first season of The Magicians was interesting but far from perfect and not an immediate favorite for me. The second season of the show helped elevate things to a new level and did a great job of deepening our understanding of the characters and pushing the story forward. The show naturally has a lot going for it as it is based on a book series and has some great stories to draw from. As much as the show isn't a perfect adaptation of the books, a lot of book plot elements have made their way into the series and helped expand on things. And then you have the acting talent brought together for this show. A lot of them were rather unlikable in the first season for various reasons (at least for me). But by the time you get to this second season, it becomes easier to appreciate their more grating traits as more like quirks or defensive mechanisms versus all that they've had to deal with in life. And this second season has a lot more in store for our protagonists. Synopsis: The Magicians is a fantasy television drama series created by Sera Gamble and John McNamara. 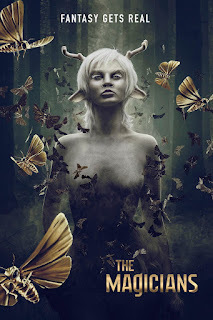 The series is based on The Magicians and related novels by Lev Grossman and airs on SyFy. The second season begins with our characters reeling from their big confrontation with The Beast, who turned out to be Martin Chatwin (Charles Mesure) of Fillory and Further fame. But our protagonists were unable to defeat him in the season one finale and now Julia (Stella Maeve) has negotiated a deal with him for his help in killing the god Reynard (Mackenzie Astin). Meanwhile Quentin (Jason Ralph) and the others race to find an alternate means of defeating Martin. To further complicate things, it seems that Martin has drained the Wellspring, the source of all magic, of most of its power, making him quite powerful. And the only way to stand a chance against him involves our heroes journeying to Fillory to find a way to secure the Wellspring from Martin, thus denying him more power. What I Liked: Having Quentin, Alice (Olivia Taylor Dudley), Margo (Summer Bishil), and Eliot (Hale Appleman) become kings and queens of Fillory in the most Narnia-esque moment in the series opened up new avenues for stories and really helped make this season work out. And the fact that the bulk of the actual "ruling" of Fillory fell on the shoulders of the unlikely rulers of Margo and Eliot was one of the best things to happen to the show and to those characters. Julia's journey initially steeped in revenge later bloomed into something a lot more thought-out with geater implications and I enjoyed her arc more than ever. When you think about all that she had gone through initially as a temporal experiment that excluded her from Brakebills has on the whole become a path for her to become one of the strongest characters in the show. And that's another great aspect to this season. And the whole "no more magic" arc that started in this season given the problems with the Wellspring was another great source for amusement. Scarcity drives creativity, I guess? What Could Have Been Better: I thought I would be happy with Alice losing herself to magic as a Niffin as she wasn't one of my favorite characters from the first season. But Alice as a Niffin and all that came after turned out to be even more annoying. I guess credit goes to the actress portraying her in a believably annoying manner since it certainly didn't help endear her to viewers like me. Penny (Arjun Gupta) has been on a sort of narrative path of redemption as he has come through for the group more than his initial character. But his initial wanderings and dealings with the Library largely felt unstructured and didn't quite get to anywhere truly relevant within this season. The whole no hands side-plot complicated things further I guess but not in a great way. TL;DR: The Magicians got a LOT better in this season, mainly because of the greater involvement of Fillory in the main story. Margo and Eliot were interesting in the first season but have become a whole different level of fascinating as they try to manage a kingdom with their limited knowledge of how to do anything on that scale. Thus the second season gets a great 4 surprise rulings as kings and queens of Fillory out of a possible 5.